I found some soy-free shortening, and the first thing I thought of was buttercream icing. I had tried to make some cupcakes with buttercream frosting for Bubs' birthday last month, but I was not too excited about how the cupcakes or frosting turned out. 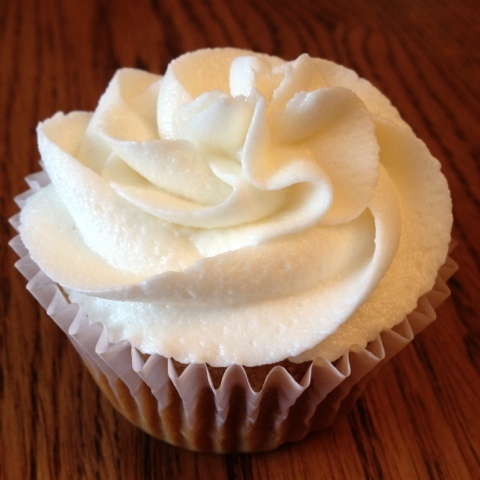 I will continue to try various "from scratch" cupcakes, but today I used a mix from Namaste that is free of Bubs' allergens/sensitivities that turned out great! Click here for my review of Namaste products. I am much happier with the way my buttercream frosting turned out today compared to a month ago. It tastes just like real buttercream! Here's the recipe. It's not that much different that the previous version I posted, but the shortening makes a big difference. Beat butter and shortening in mixer. Add milk, vanilla, and salt. Continue to mix while slowly adding powdered sugar. Whip on high for about 5-7 minutes. Pipe onto cupcakes with desired decorating tip.